On this day my thoughts turn to the somber events of September 11, 2001, when so many innocent lives were lost in the brutal assault on the twin towers of the World Trade Center and the further attacks in Washington D.C. and Pennsylvania. I join you in commending the thousands of victims to the infinite mercy of Almighty God and in asking our heavenly Father to continue to console those who mourn the loss of loved ones. The tragedy of that day is compounded by the perpetrators’ claim to be acting in God’s name. Once again, it must be unequivocally stated that no circumstances can ever justify acts of terrorism. Every human life is precious in God’s sight and no effort should be spared in the attempt to promote throughout the world a genuine respect for the inalienable rights and dignity of individuals and peoples everywhere. With these sentiments, I extend my most affectionate greetings to you, your brother Bishops and all those entrusted to your pastoral care, and I gladly impart my Apostolic Blessing as a pledge of peace and serenity in the Lord. When Pope XIII published Rerum Novarum (On the Condition of Labour) in 1892, it was considered a brilliant piece of thinking on the Church walking closely with the average man and woman because it demonstrated that in reality, once again, the Church situated herself in the reality of human existence: in the social, political and economic spheres with a keen recognition of human dignity; the protection of basic economic and political rights, including the right to a just wage and to organize associations or unions to defend just claims; the right to private property; the rights of labor over capital; the just organizations of society for the common good. Pope Leo rejected not only a communistic philosophy but he did not ignore the basis of its appeal to workers and condemned the exploitative nature of the liberal-capitalist alternative. He wanted the Church on all levels to be engaged with the social order which slowly took shape in the later years of the 19th century and then in the 20th and 21st centuries. 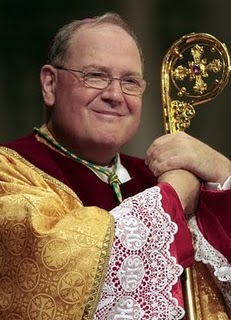 Posted on his blog today, The Gospel in the Digital Age, Archbishop Timothy Michael Dolan wrote a piece on meaning of marriage and family according to natural reason and Catholic belief. His Excellency makes several and crucial points that require our clear attention. A sound-bite understanding of these important issues is insufficient for us. On Wednesday, the 27th April, at the Church of St.
with the St. Gianna relics by the Archbishop. present in reception area to answer questions and offer support following Mass. This Sunday & coming Tuesday the lay ecclesial movement Focolare is celebrating their 50th anniversary in the United States of America. America at St. Patrick’s Cathedral. and the Law” interfaith project for lawyers, judges and law students. interested may review the the program & register at: law.fordham.edu/unity.